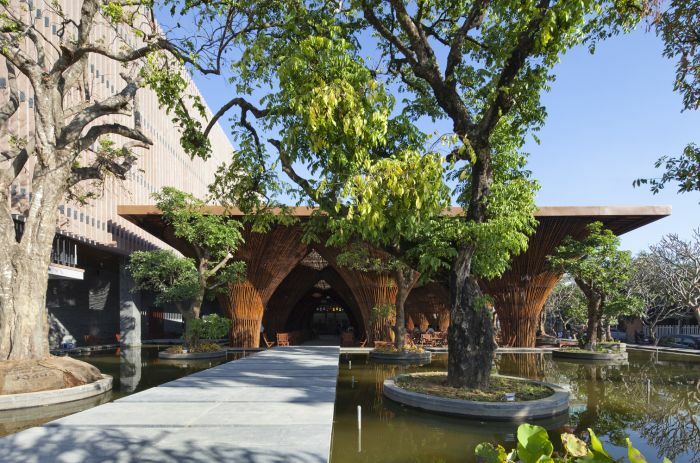 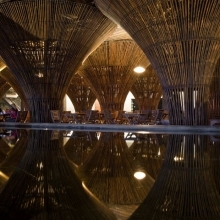 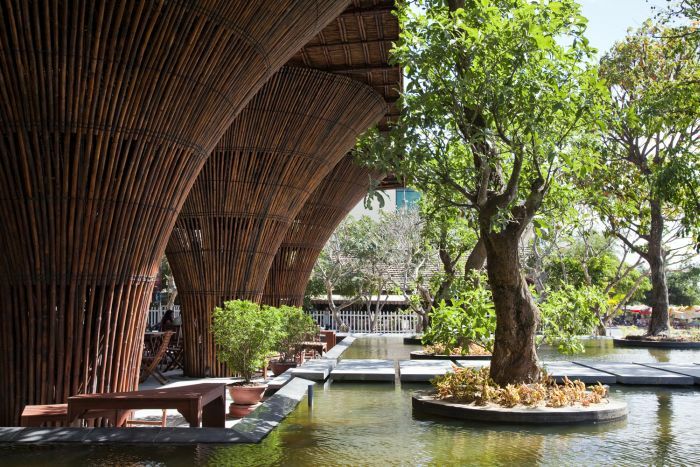 Kontum Indochine Café is designed as a part of a hotel complex along Dakbla River in Kontum City, Middle Vietnam. 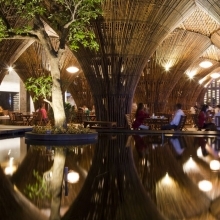 Adjacent to Dakbla Bridge, a gateway to Kontum City, the cafeteria serves as a breakfast, dinner and tea venue for hotel guests. 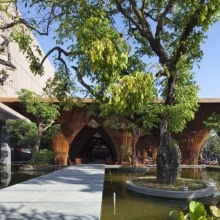 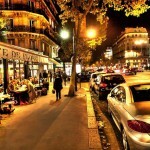 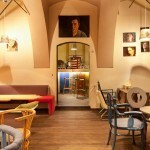 It also functions as a semi-outdoor banquet hall for wedding ceremonies. 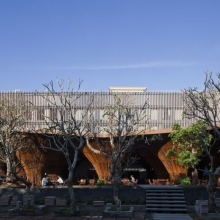 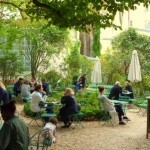 Located on a corner plot, the Café is composed of two major elements: a main building with a big horizontal roof made of bamboo structure and an annex kitchen made of concrete frames and stones. 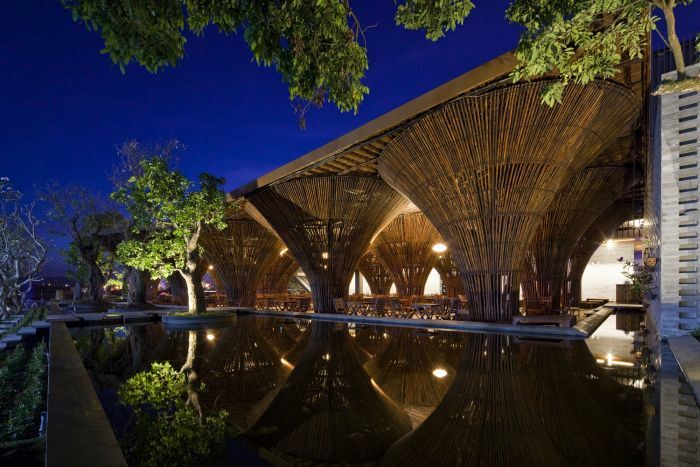 The main building has a rectangular plan surrounded by a shallow artificial lake. 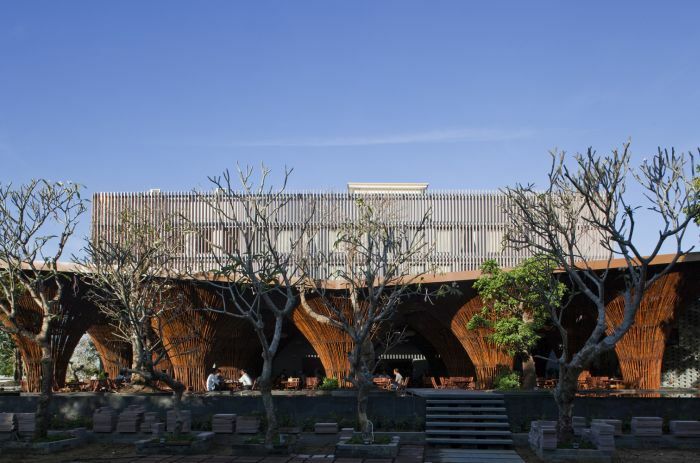 All elevations are open to the air: the south facade faces the main street along Dakbla River, the east to the service street, the west to a restaurant and banquet building belonging to the hotel complex and the north to the annex kitchen which serves the Café. 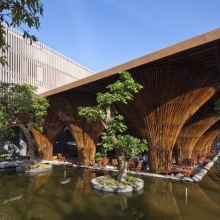 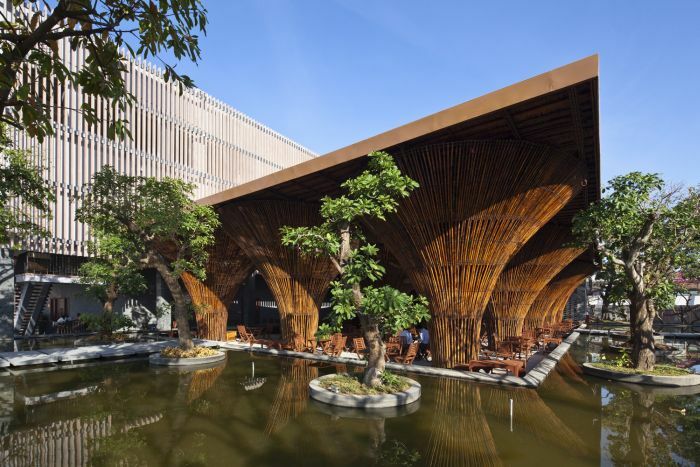 By providing shadow under the bamboo roof and maximizing the cool air flow across the water surface of the lake, the open-air indoor space successfully operates without using air conditioning even in a tropical climate. 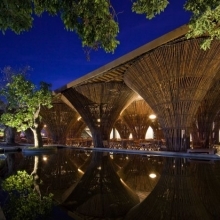 The roof is covered by fiber-reinforced plastic panels and thatch. 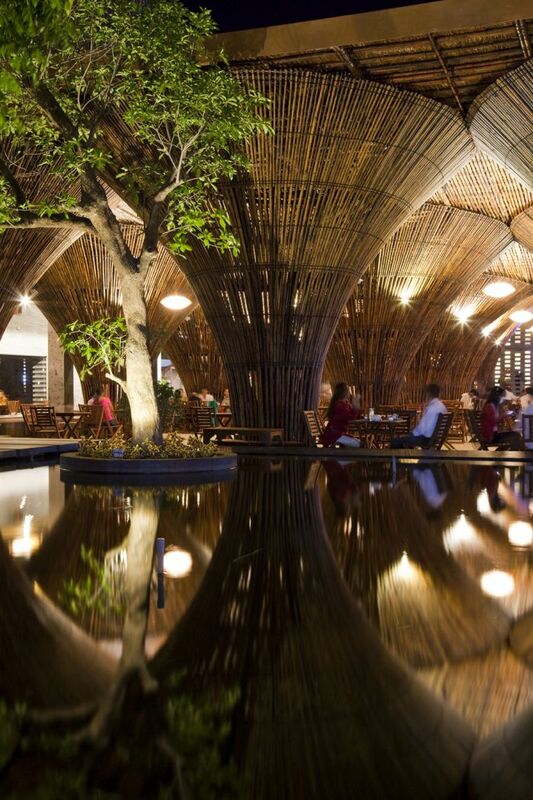 The translucent synthetic panels are partly exposed in the ceiling to provide natural light in the deep center of the space under the roof. 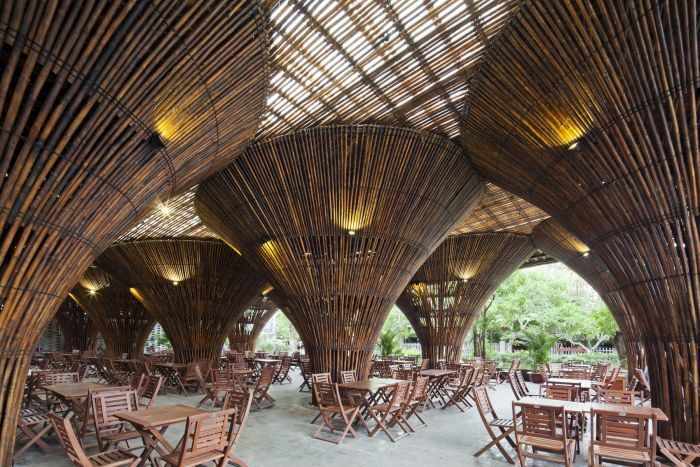 The roof of the main building is supported by a pure bamboo structure composed of 15 inverse-cone-shaped units. 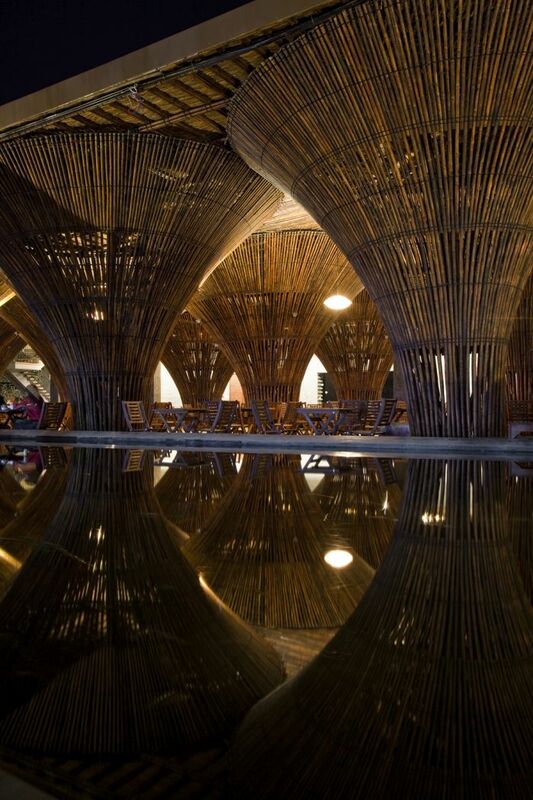 The form of these columns was inspired by a traditional Vietnamese basket for fishing which gradually narrows from the top toward the base. 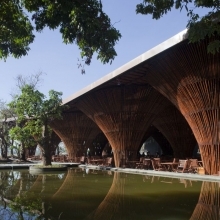 This open structure maximizes the wind flow into the building during the summer, while resisting harsh storms during the windy season. 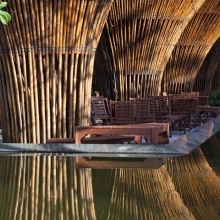 From the Café, hotel guests can enjoy a great panoramic view of the mountains and Dakbla River framed by the bamboo arches. 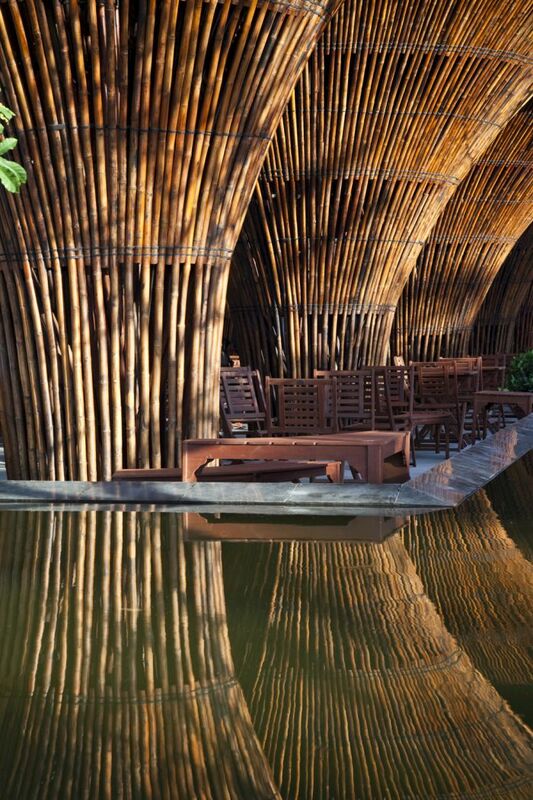 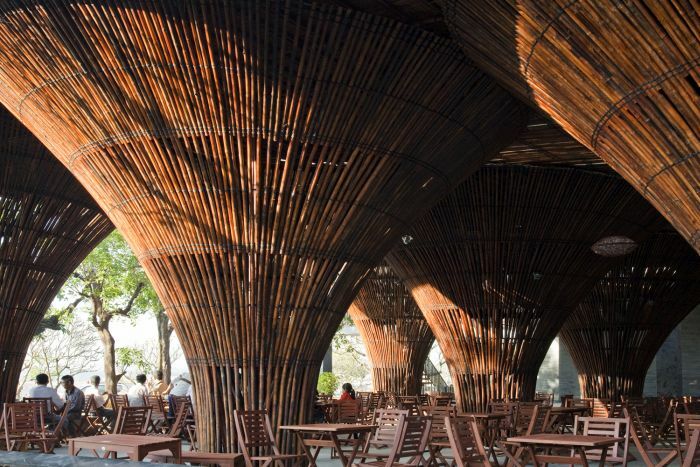 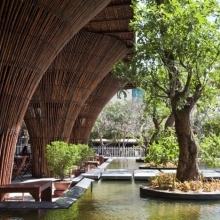 The bamboo columns create an inner lining giving the impression of being in a bamboo forest and show the continuity to the mountains as seen from the café. 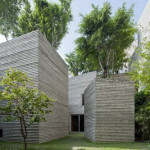 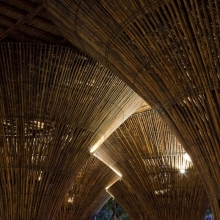 The challenge of the project is to respect the nature of bamboo as a material and to create a distinctive space unique to bamboo. 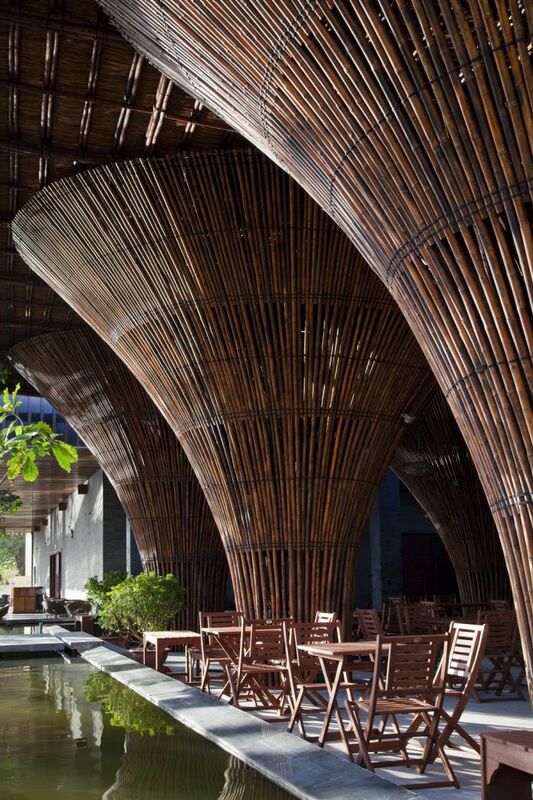 The material characteristics of bamboo are different from that of timber or steel. 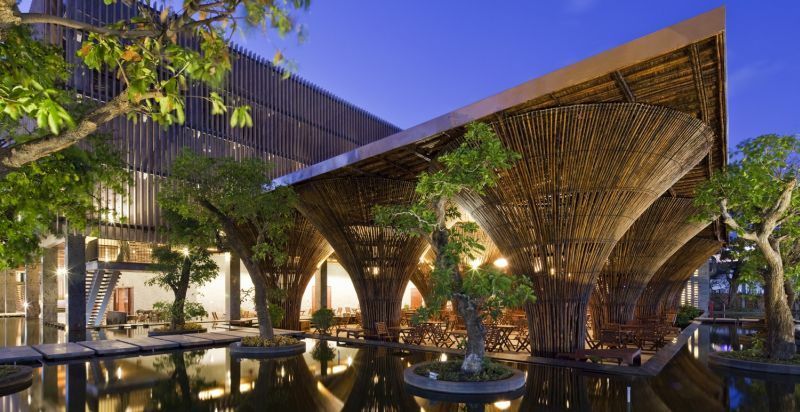 If the details and construction methods of timber or steel structures are applied to bamboo structures, the advantages of bamboo may be impaired. 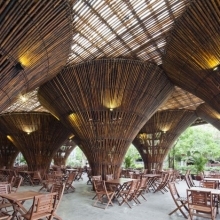 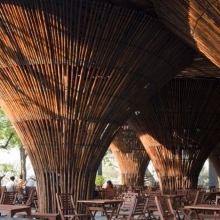 For instance, using steel joints kill the cost benefit of bamboo structures. 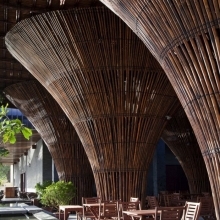 Steel pin joint generates too much local loads which is not appropriate for bamboo, which tends to be subject to buckling. 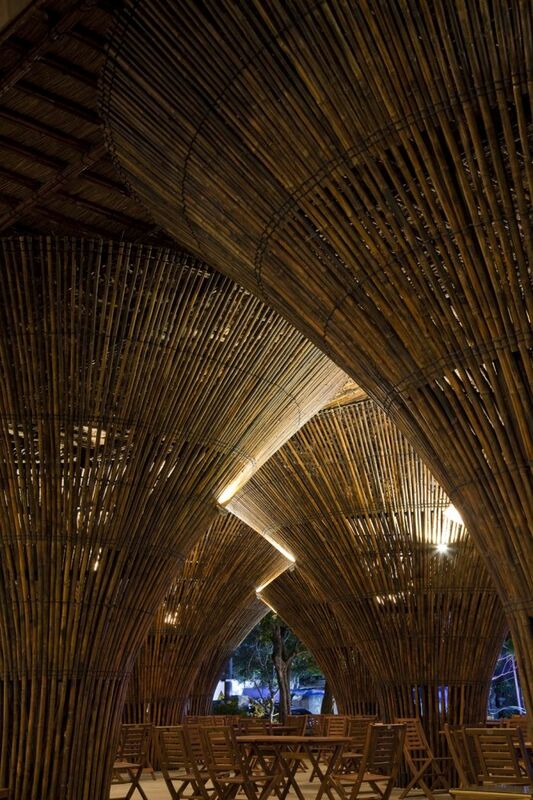 “In this context, we use traditional treatment methods (soaking in mud and smoking out) for the treatment of bamboo, and we use low-tech joint details (ratten-tying and bamboo nails), which is suitable for bamboo structures. 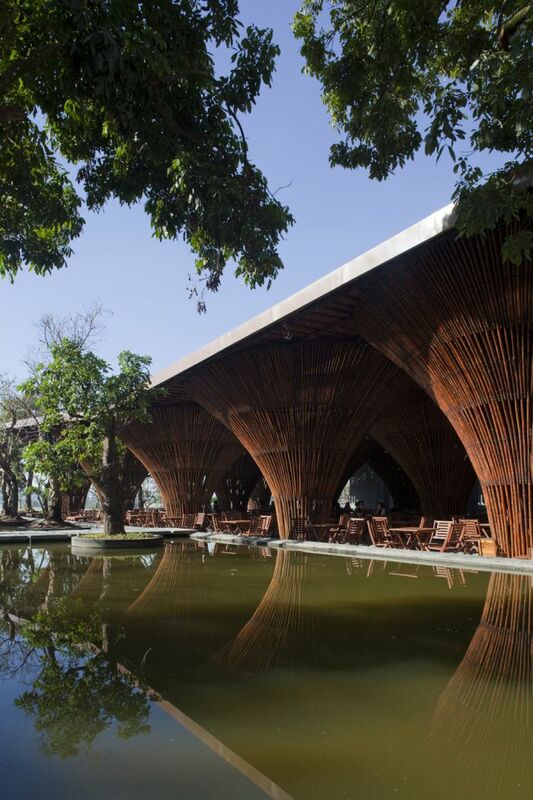 The columns at Kontum City are prefabricated before their erection to achieve the appropriate quality and accuracy”, the architects of the building explain.